Software quality is one of the most important aspects of a successful project. It makes a significant part in case of market’s overload of different software. Even if a group of developers comes up with and realizes new and extremely useful idea, other developers will work with the same idea and will make it with higher quality adding new features, creating more beautiful and convenient design etc. EasyQA proves that we have tried our best to make a convenient and easy interface with functionality used while developing in order to make test processes as well as product quality control easier and more comprehensible for the whole team from a tech writer, designer to a back-end developer and database architect etc. One has to choose tools which will assist in the developing process when planning a product. The team has to do without some of them in the case of a tight budget. Taking this issue into consideration, you can see that EasyQA has all the necessary tools built-in. Instead of paying for each of these tools separately, you can now pay for all of them in one package for a fixed price. If your team uses different tools, they spend a lot of time searching for the information they need. For example, they have to look for a build in their mail box, a test plan in the documentation, and still having to launch the bug tracker separately. A tester needs approximately 5 minutes to catch a crash and create a bug for it (with a log file or video attached). If a crash is difficult to catch, it takes even more time. However, by using EasyQA, a technician only has to press a few buttons to create a fully featured bug report, in a matter of seconds. Only necessary and useful functionality. Minimalism has been a trend of the last few years. So, IT tries to create applications in a minimalistic style. Products which have preserved on the market for a longer time often surprise us with new solutions and functionalities. We have attempted to create a simple interface that contains all of the necessary features required to provide a good flow for reporting issues. Information content and graphic results. We are aware how important it is for a team to monitor the results of their work, and report them to the clients in a concise and readable manner. Several years ago QA engineers had to put a lot of efforts and were spending much time to collect the information about the last build, the number of bugs, crashes, tests etc. But as Henry Ford said: “Everything can always be done better than it is being done”. You can generate this information automatically in EasyQA test management tool. You can use EasyQA where all reports are collected in one place and you can access them by pressing a single button. We have created a few diagrams which help to track team members’ work. We let our users do what they want. A lot of test management tools and services ask to choose a platform for your future project immediately when you create it. They require to upload a test object and choosing the strategies immediately. EasyQA makes way for our users' work. You can start using our service almost immediately, just after having a rough idea of how the project should look like. No need to have a test object in the first place! Test planning, user stories, and developer tasks are available from the get-go. You could start working with EasyQA to catch the crashes or share the build first. We do not require keeping the standard rules, you are free to work as you prefer. Make your own rules. We are glad to support small startups providing our service free of charge. We offer very favorable pricing and customization services if need be for middle and large companies. We could say that EasyQA has no flows but we are humans and cannot plan everything perfectly. Our project was developed several months ago. We have released Beta version which has few bugs. But according to one of the principles of testing "Exhaustive testing is impossible". Unfortunately, there will always be bugs. Our task is to minimize their influence on the service performance. The list can be extended however we are interested in users’ opinion because the thing suiting one person does not suit another one. We are collecting all the feedback and tracking the users’ needs in order to improve. You create an organization after registration. It serves as a fortress for your team and projects. 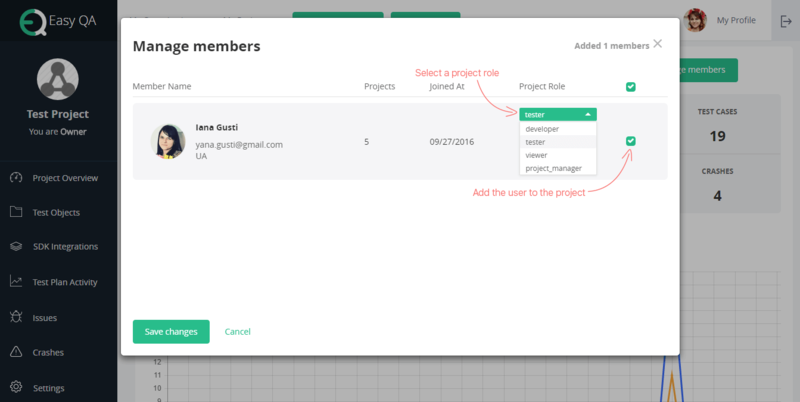 You can invite members, assign them with roles and give them rights, create projects. 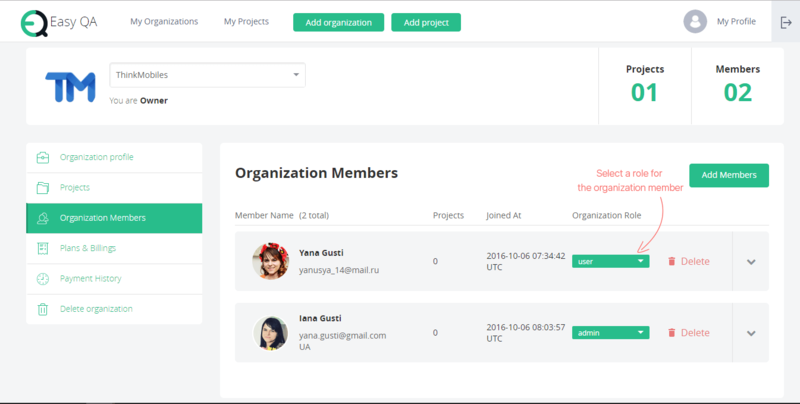 The adding members’ format allows adding many users at the same time. So if you have more than 500 employees you will not need to add each one separately. A test object is a little thing which is the main idea of making a team, investing time and money and which then makes the users happy. EasyQA test management tool will help you make your test object perfect. We offer an easy way of test object sharing. A user uploads .ipa or .apk file or adds a test object link and all users get an immediate access through the generated link. You can copy the link or send it by email. When using a mobile application you should only open the link in a mobile browser and a test object will be uploaded. So there is no need to share builds through other services. You’ll build your test process around only one test management tool. It’s really convenient, isn’t it? EasyQA test management tool provides access to creating a test plan, planning test cases, execute testing on the case basis and generating a report within one page. It gives an opportunity to work in different test plans on the same page, in the same window. Several testers can work at the same test plan. You can also add cases from all available test plans when making a test run. A Team Lead can create a test run and assign it to another project’s tester. When going through test cases you don’t need to open each one separately. You can easily switch between them using the prev/next buttons. You can receive an update on project development even if the testing is not finished yet. We have tried to stick to minimalistic principles when creating Issues page at EasyQA service. A user-friendly agile board containing only a couple of columns is convenient for creating any application. When you create a task or a bug, a card is in Submitted column. If you need to discuss something there is a To Be Discussed column. Then go well-known Reopened and In Progress columns. All cards should go through Team Lead and QA as almost each team has them. So we implemented the Code Review and QA Review columns. Successfully completed tasks go the to the Closed column. Only useful things! We still give the user an opportunity to customize the agile boards. A great tool developed by ThinkMobiles, the EasyQA SDK is compatible with both Android and iOS apps. It allows you to record any and all crashes that might occur during the process of testing the app. This is achieved by integrating our SDK into the code and doing some additional code authorization on a server. Furthermore, if you found a crash you choose whether to send it or not. For instance, you don’t need to send crashes while debugging. You can review a log file or send a bug directly from your phone! You can take a screenshot, record video, describe the steps and send everything to Issues page with SDK. At last, we would like to thank the team which has been working on EasyQA web-based test management tool development and will continue working on the project and of course to our first users who, despite of the Beta mode, are actively using the service.